I am the good shepherd: the good shepherd giveth his life for the sheep. But he that is an hireling, and not the shepherd, whose own the sheep are not, seeth the wolf coming, and leaveth the sheep, and fleeth: and the wolf catcheth them, and scattereth the sheep. The hireling fleeth, because he is an hireling, and careth not for the sheep. I am the good shepherd, and know my sheep, and am known of mine. Sleepest or wakest thou, jolly shepherd? Thy sheep shall take no harm. Brian Aldiss finally managed to get his novel, Report on Probability A, published in 1969. The book was a sci-fi interpretation of Werner Heisenberg's Uncertainty Principle and the possibility of the existence of other universes. 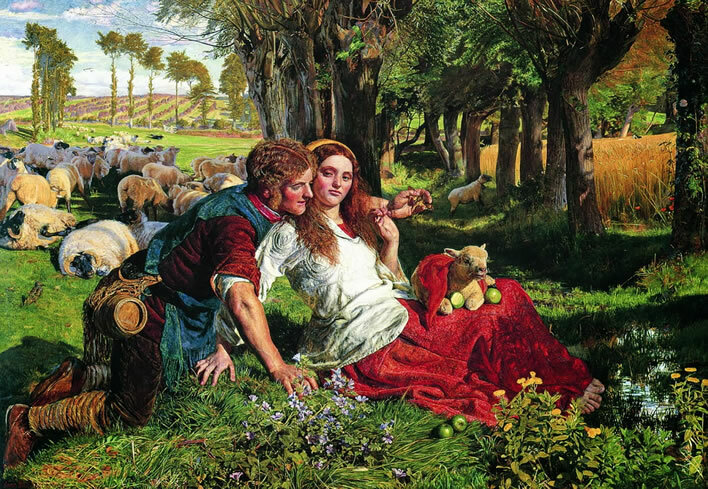 In the final version of the story Aldiss introduced William Holman Hunt's 1851 painting of The Hireling Shepherd as a leitmotif that appears in each of the 'realities' that are being observed by various 'watchers' throughout the story. The action takes place in a house occupied by Mr and Mrs Mary. They are being watched by three other people from outbuildings: the Gardener (G) from the summer-house (S), the Secretary (S) from the coach-house (C) and the Chauffeur (C) appropriately enough from a garage (G). The whole situation is being watched by a further group of characters, who are writing a report on it, the 'Report on Probability A' of the title. I read the novel in the late sixties, but remembered nothing of it save its allusions to Holman Hunt's painting. On re-reading the novel half a century later it became clear why I had forgotten so much: the text is badly written and self-indulgent, the actions tediously forgettable, the story incomprehensible. It comes as no surprise to find that it took Aldiss half a decade before he found any publisher to take such a strange work on. That is what happens when you write novels about stuff no one understands. The final paragraphs of the book seem to imply that the persons in the painting also exist as living persons in some parallel universe – for me an ontological step too far. Here are the moments when the painting appears in the story. The discussions about the painting between the 'Watchers' who are writing the report have been left out: they are now just odd and dated. Do not ask what the novel is about. Remember: you are just another observer of the novel, the extracts on this website and the painting in the Manchester Art Gallery and its reproductions here. Good luck! G was looking at a black-and-white reproduction of a painting hanging slightly above and to the right of a cupboard of unpainted wood. The reproduction was mounted and framed in a frame of varnished wood. The subject of the picture was a rural scene. Sheep grazed, hay stood in stooks, wheat ripened. In the foreground, a country lad, possibly a shepherd, wooed a girl. The girl looked at the country lad doubtfully. Flowers grew, apples lay by the girl's skirt. As G sat looking at the picture, his mouth came slowly open. His gaze became unfocused. To the crossbeam just above S's head as he sat on the log was nailed another invented scene, executed in an artist mode differing greatly from that of the travel poster. This picture was framed in a simple wooden frame to the back of which a metal device was affixed; this device raised a loop of metal above the back of the frame, and it was through the loop that the picture had been nailed so that it hung against the crossbeam. Reproduced in black and white, the picture bore a legend in the white margin below it which read: W. H. HUNT; The Hireling Shepherd (Oil, 1851). Two figures were depicted in a sunlit rural scene. The left-hand figure was the hireling shepherd whose flock of sheep waited in the background. The hireling shepherd had caught a death's head moth and appeared to be displaying this insect to the second figure, a girl who sat with a lamb upon her lap. The hireling shepherd leant close against her to demonstrate his capture; since the girl with the lamb on her lap appeared to have removed one of her outer garments, the nature of their past, present and future relationships was ambiguous. The girl looked over her right shoulder with an expression that also was ambiguous. Her mouth appeared pale, with an ample lower lip that perhaps pouted slightly; her eyelids drooped as she looked askance at the man. On some occasions it seemed to S that she regarded the hireling shepherd with a sort of indolent contempt, on other occasions that her expression was one of lazy complaisance. Slowly his gaze began to move over the room. It fastened on a picture framed and hung on the cross beam nearest to him. The picture was a representation in black and white of a man and woman in a rural setting. In the background might be seen a flock of sheep and a cornfield bathed in sun, the two divided by a grassy lane shaded by willows growing on either side of it. In the foreground, on a bank covered with flowers, were two people, depicted at a moment which left their motives for ever in some ambiguity. One of these figures was a country girl. On her knee rested a lamb and two apples; two more apples lay beside her. It could be presumed that the girl was feeding or attempting to feed the lamb with the apples. The girl had been interrupted in her task by the second figure, a young shepherd dressed in the fustian of a bygone age. He leant confidentially over the girl's shoulder after having scrambled up the bank; his left cheek appeared to rest against the girl's hair which, being long and unconfined, lay over each shoulder. After regarding these two representations of people for some while, S rose to his feet and moved closer to the picture; he began to examine it at eye level. He breathed on the glass so that the two representations were obscured, lifted his left arm, and rubbed the glass with the cuff of the left sleeve of his shirt. The picture was now clearly visible through the glass. In the foreground, the two persons sprawled on a flower-covered bank, their bodies forming a sort of inverted V, with their heads together at the top of the V, for while the shepherd was on the left of the central axis of the picture, kneeling and leaning forward, the girl with the lamb on her lap was sitting on the right of the central axis of the picture and leaning backwards; the girl was supporting the weight of her torso by a right arm thrust backwards until the hand had come to rest at a point further to the left than an imaginary straight line dropped from her shoulder, with the result that this arm took up a diagonal that nearly matched the diagonal of the shepherd's body, against which it seemed lightly to rest. If there was anything behind this phenomenon, if it was not its own lesson, then it could be interpreted to mean that although the girl in part leant away from, or was averse to, the advances of the shepherd, there was nevertheless a part of her that inclined towards him, or was predisposed to accept his advances. It was open to interpretation whether the shepherd was intent upon becoming more intimate with the girl, or whether his absorption was in the collection of lepidoptera: for he leant forward clutching gently in his left hand a large death's head moth which he thrust forward over the girl's left shoulder for her to inspect. Either he had brought this creature as a pretty thing that might serve as a pretext for becoming more intimate with her (and the possessiveness of his pose suggested this alternative) or else he was more concerned with the fine specimen that he had managed, surely with some skill, to capture intact (and the solemnity of his gaze at the moth favoured this alternative). This latter interpretation seemed the less likely, since shepherds, whose associations with nature render them unsurprised by its manifestations, rarely become lepidopterists. On the other hand, this particular moth, fine specimen though it was, represented an unfortunate choice of a bauble with which to lull the girl's apprehensions, since superstitions attaching to the death's head moth would make it an object of unease to such a simple country person as the girl depicted. In any event, the girl was not regarding the moth. She had turned her head away from it, though whether this was from a revulsion for the moth or because in so doing she could have a close look at the face of the shepherd, virtually resting on her left shoulder, remained in doubt. and set widely apart; they lay under heavy, even puffy, lids, while the lower lids were also noticeable. Above these lids were broad soft eyebrows, untouched by art. The nose seemed not too long and rather soft, an on the whole attractive nose, ending in a little soft bulb of flesh. The mouth too looked attractive in texture, though the broad lower lip gave it something of a pout; if it was pouting, there was no reason within the context of the picture not to suppose that the girl was pouting because she mistrusted the advances of the young shepherd. The look in her eyes could be read as reinforcing this impression, for they glanced sideways at him with an expression which might have been lazy contempt; on the other hand it might easily have been one of indolent complaisance. It was tantalising to imagine that the painter could have created a second representation of this same imaginary scene, setting it say fifteen minutes (they would have to be imaginary minutes on an imaginary time scale, since art has little relation to the ordinary dock) ahead of the existing representation. Many doubts could then have been resolved, for one paradox of the existing picture was that its ambiguities were engendered by the fact that it showed only one moment on its time scale. Suppose that the second representation, depicting the same scene some fifteen minutes later, could be produced. It too would only show one moment on its time scale; but by comparison with the earlier moment in the first and existing picture, it would make much clear. For instance, it might show the shepherd some distance away in the middle distance, back tending his sheep; in which case it would be clearer that in the first and existing picture the shepherd's interest lay at least as much in the moth as in possession of the girl, and that the girl's expression contained more lazy contempt than complaisance or concupiscence under the heavy summer lids of her eyes. Or the second picture might show that the warmth of the summer day had worked in these young bodies, and that the more instinctive side of human nature had had its way, that the girl's expression in the first and existing picture might indeed have been sly, but was also full of complicity; for this second picture might depict the sheep untended breaking down the corn, and the flowers of the bank crushed, as the shepherd and the girl became lovers, their bodies lying parallel and together, with that pale, soft, pouting lower lip pressed beneath the man's heavy kisses. But the imaginary picture remained imaginary, and the existing picture remained open to torturing interpretation. A picture hung on S's side of the beam. His shirt caught the corner of the picture frame, setting it swinging. S stepped back and steadied it. The picture was in black and white, though behind the glass both the black of the print and the white of the paper were faded. The picture showed a man and a woman touching each other, the man dressed in the garb of a shepherd, the woman in some sort of smock, worn over a skirt; it was not certain that she was not partially undressed. The shepherd was clearly neglecting his sheep, which had begun to stray into a field of corn, to secure the attention of the girl. It was difficult to understand from the picture whether his efforts to interest her were meeting with success, for her look could be read either as scornful or as one of sly desire. The shepherd was holding out for her inspection a moth of a certain species which he had caught. The girl was looking away from this moth towards him. It was impossible to determine whether he would stand a better chance of winning the girl's complaisance (if that was what he sought) by abandoning his attempt to interest her in the moth, perhaps by letting it fly away, and concentrating on less indirect attempts at persuasion, such as stroking her tawny hair and paying her compliments, or by continuing to exhibit the captive moth, offering at the same time a sort of lecture on natural history which might win the girl's confidence and be turned later to good effect as it led to more intimate conversation. The situation was possibly as challenging for the shepherd to resolve as it was for the onlooker. If the girl was married to the shepherd's employer, the situation might be even more difficult. For it was possible that under her heavy lids she was looking at him in a way which he was at liberty to misinterpret as encouraging; he might then run his hands through that tawny hair, so soft about the nape of the neck; he might even attempt – half succeed! – to kiss that plump underlip; and she might then go to her husband and reveal what had taken place, thus involving the shepherd in a number of troubles; or, once in that difficult position, he might be unsure whether it had been brought about because the girl had told her husband voluntarily, or whether, in his plodding way, the husband had forced a confession from her. He might be dismissed from his post, to hover for ever after like a troubled spirit about the scene and cause of the disaster. Stuck to the side of one of the cartons was a cheap colour reproduction of a once-popular painting. It was possible to discern in the fading light that it represented a symbolic confrontation between the two sexes in which, by inserting certain images, the artist had cast doubt upon both the advisability and the possible success of the confrontation. This ambiguity was further increased by the poor light, which fused the man and woman portrayed into a semi-recumbent whole, in which only the faces of the pair, and of a lamb upon the girl's lap, were really distinguishable. Forgetting his flock, the youth leant forward, so that her sturdy form touched his chest and arms. As she half-turned, her hair was against his cheek. He could smell the warmth of it and the scents of her body, which the sunny day released. Nobody was near. The sheep could take care of themselves. Within his imprisoning hand, he could feel the doomed moth flutter. Her hand was raised towards it in a gesture of indecision. Excerpts from Brian Aldiss (1925-2017), Report on Probability A, 1969, London, Sphere Books. ISBN: 978-0-7221-1108-6.